Better Family Photos: Hot Rumor: Nikon Acquires Samsung NX System! 1. Mirrorless is the wave of the future. This is not so much because of any inherent superiority of mirrorless, but simply because mirrorless is cheaper to produce, and has fewer moving parts (and therefore is less likely to malfunction). 2. Sony is becoming the 800-lb. gorilla of mirrorless. Sony's mirrorless cameras have been earning accolades from photographers and the press. Sony's a6000 was a huge hit. Moreover, Sony's full frame mirrorless cameras have been amazing, and they literally have no competition. 3. Nikon has been floundering in mirrorless. Nikon entered the mirrorless market half-heartedly with the Nikon 1 series, which have not been very well received for several reasons, including its small sensor. 4. Meanwhile, Samsung has leapfrogged Sony in sensor technology. Its latest sensor, used in the NX1 and NX500, have edged out its competition to become recognized as the best sensor for APS-C for now. 5. However, Samsung failed to gain a significant market share with the NX1 and NX500. 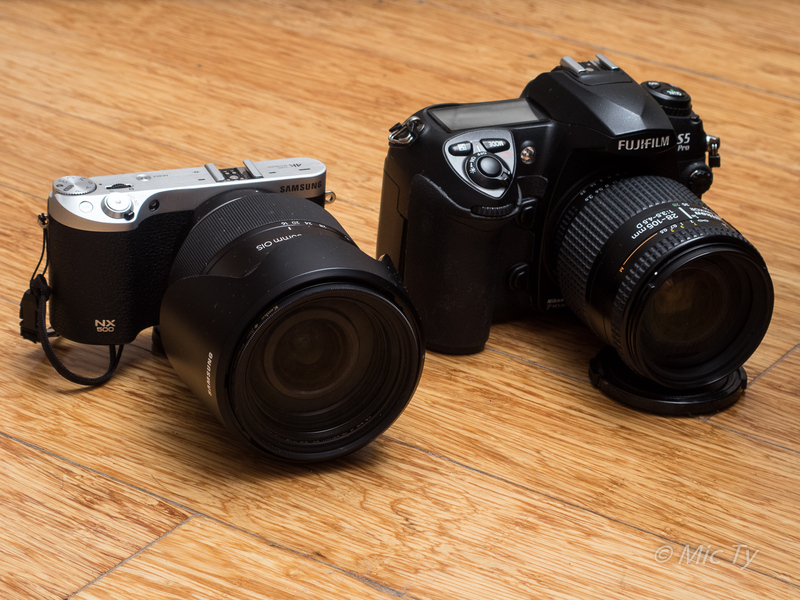 Reviewers loved the NX1 and NX500 (reviewed here) but they have not catapulted Samsung's market share the way the a6000 and a7 did for Sony. I believe that part of the reason is that Samsung doesn't have as much credibility to photographers as some of its competitors. Meanwhile, Nikon has a stellar reputation and the respect of industry professionals. 6. Samsung is already leaving the UK and German market. There were rumors swirling around of Samsung leaving the camera business, and Samsung took the step of denying those rumors. However, subsequently, Samsung has confirmed that it was leaving the German and UK markets. It's pretty strange for Samsung to do that after making somewhat of a splash with the NX1 and NX500, unless Samsung has other plans for its awesome sensor. 7. It's been done before. An acquisition between Nikon and Samsung already has a precedent. In 2006, Sony acquired Konica Minolta to enter the DSLR market. We will probably find out on or before January at CES 2016. WILL NIKON KEEP THE NX MOUNT? While Nikon is acquiring Samsung's NX technology, it is not yet certain that they will keep the NX mount. However, I think Nikon will keep the NX mount. 1. The Nikon 1 is not strong enough to dominate the mirrorless market. If all that Nikon does with Samsung's technology is to use Samsung's sensor, it wouldn't disrupt the market at all. You know about that cliché about the definition of insanity. 2. If Nikon just wanted to get good sensors, it can already get them from Sony, or order them from Samsung. It doesn't make sense to acquire an entire camera division merely to get better sensors. 3. If Nikon abandons the NX mount, it would have to develop a whole line of APS-C mirrorless lenses, AND convince the market that the new system is viable. That would take too much time as well as resources. By then, Sony would be way ahead of the game. It would also be a waste of the lenses and bodies Samsung has already developed. For these reasons, the only logical alternative for Nikon is to keep the NX mount. WHAT CAN WE EXPECT FROM SUCH A PARTNERSHIP? Supposing Nikon does indeed purchase Samsung's NX division and keeps the NX mount. What impact would that have on consumers? Sensors. Samsung has the best sensors at the moment and seems to have leapfrogged Sony's sensor technology, whereas Nikon relies on Sony to manufacture its sensors. We would expect future Nikon cameras to rely primarily if not exclusively on Samsung sensors. Given the performance of Samsung's most recent sensors, this is a very good development for Nikon shooters. Even better image quality. Nikon is very good at squeezing the best performance from sensors. Sony sensors on Nikon bodies usually perform slightly better than their Sony counterparts. I expect Nikon will apply their magic sauce to the Samsung sensors to get even better performance from them. Lenses. Nikon excels in lens design and has a comprehensive lens system. Samsung has also produced pretty good lenses but they have very few lenses compared to other camera systems. I believe Nikon will produce an adapter for F-mount to NX-mount, allowing Nikon's F-mount lenses to be used on NX-mount bodies. Meanwhile, if Nikon is serious about mirrorless, they will also produce dedicated NX-mount lenses to fill in gaps in the NX lens line, such as a walkaround zoom (probably 18-105 f/3.5-5.6 VR) and a telephoto (70-300 f/3.5-5.6 VR). Flash technology. Nikon has a very well developed lighting system, while Samsung's flash system is primitive. I expect that Nikon will make an adapter to allow Nikon's flashes to be used on NX bodies. Autofocus. Nikon has a very well-regarded autofocus technology. It is possible that they might apply their autofocus algorithms to NX-mount bodies to give them better autofocus consistency. Colors. This is one area I'm a little worried about. I love the colors on Samsung cameras. I personally find Nikon's colors a little too orange. I'm concerned Nikon might apply their color processing to future Samsung bodies. I guess I would have to rely on color calibration to fix that. So, in summary, Samsung handing over its NX system to Nikon makes a lot of sense. The future looks bright for Nikon and Samsung shooters.